I had the pleasure of reading a book recently by Matthew Kelly, entitled Resisting Happiness. We attended Mass at my mom’s parish after Christmas and it was handed out there. It was excellent! I highly recommend it and I am quite certain that I will refer to it in future blog posts. The book really spoke to me, because I recognize that I give into resistance a lot. I suppose that is why I haven’t posted on this blog since August! I have things I would like to write about. I know that those things have the potential to help or encourage other people. Yet, I busy myself with so many other things. It’s not that those things aren’t important. Some are – but some aren’t. Here’s the thing though. I have spent most of my life running from or resisting God – and that holds me back from being the person God created me to be. I do not resist out of lack of love for Him – I do love Him! I don’t resist because I doubt his existence –I know He does. Not even because I think I am better off without Him – I know that I am not. For years, I resisted his gentle pursuit because I didn’t truly believe in depths of His love and mercy. I didn’t feel worthy and I was afraid to trust Him with everything. I also didn’t understand how He lavishes grace upon grace (JN 1:16) and allows the Holy Spirit to work through those who call upon Him. It wasn’t until I started reading and meditating on scripture – those God breathed words – that I began to understand a bit more and to rest in His promises. I began to realize that I don’t always have to know where I am going, because the Lord is in all my days. Also, “God doesn’t call the qualified, he qualifies the called”. I like to think that I do. I try to always greet people with a smile and to be kind, supportive, and positive. I try to use my knowledge and talents to glorify God. This is not something I have always done, but I really try to think about what I am spending my time doing and make sure that most of what I do aligns with what God asks of me. Except…except this blog and my writing. Not so much my personal journal writing or the writing I do for my clients – but I know God is calling me to more. So what is stopping me from writing those books I have been thinking about? What stops me from producing the tools I know can help Catholic families connect and strengthen their faith and knowledge? What stops me from writing the many blog post ideas that I have? Matthew Kelly tells us that God created us to let our light shine and that resistance doesn’t want that to happen. Resistance doesn’t want us to share the light of Christ with others through things we do or say. I started thinking about this. What stops me from letting my light shine? I determined that it comes down to a few things. Maybe you can relate. What if I spend all this time on something and I pour myself into it and no one likes it. No one notices it. It doesn’t help even one single soul. What if I create something and it is met with criticism? What if it isn’t as helpful as I think it will be? What if I write a book, spend hours doing the writing and research necessary, and no one wants to publish it – or read it? 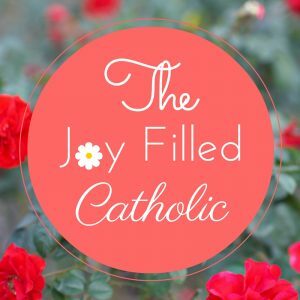 There are so many talented individuals out there creating great resources for Catholic families. Sure, I see a need or a hole my content can fill – but it will never be as good as the things I see others doing. Here’s the thing that I am am realizing and that I must remember. Doing these things is not for me. God created me for His purpose and I have work to do. The things I want to accomplish aren’t meant to make a light shine on me. What they are meant for, is to share the light of Christ with others. These things I am called to do are not for my glory but for the glory of the Lord. It is all to lead others to Him; who is the way, the truth, and the life. (JN14:6) If it is truly his purpose for me to do something, he will make my path straight and regardless of outcome all efforts will be used for His good. Don’t look back. St. Paul said, “I press forward.”You and I have work to do and we must do it together. Every man, woman and child must know Jesus. God has created you with a fire, a spirit, to inflame others. You can no longer sit, waiting for something to happen. You make it happen. You’re the only one God has. Each one of us is here for a unique purpose. How will you use your gifts? How will you multiply God’s Grace? What is stopping you from letting your light shine? Previous Post Let Us Love and Encourage One Another!